Argan Oil (argania spinosa) from the argan tree in Morocco has almost twice as much vitamin E as olive oil and is rich in anti-oxidants. It is 80% unsaturated, containing eight essential fatty acids. Argan oil also contains rare plant sterols not found in other oils. It helps to prevent loss of moisture from the skin. We use the pure, eco-certified fair trade argan oil. 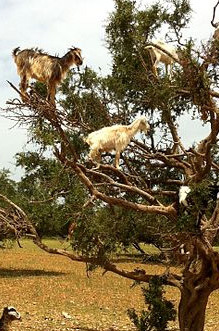 The nut seeking goats DO climb the trees!